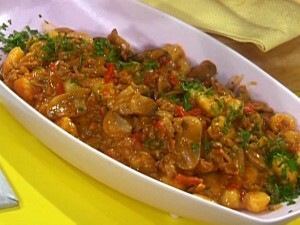 Chicken And Mushroom In Red Sauce recipe by Madiha Naeem at DesiRecipes.com. Prepare the red sauce seperately mixing ketchup, soyasauce, hot sauce, wostershire sauce and keep to a side. Fry the chicken in aproxx 4 tbs oil for 10 min then add the onions fry cover and cook for 5 min then add garlic paste blackpepper and mushrooms and fry well for 10 min add mushrooms stir well add the prepared red sauce cover and cook for 10 min and serve hot.